It has been 37 years since Dr Allan Hoffman gave President Jimmy Carter the plan that could have started America’s renewable revolution. The idea was shelved after Reagan was elected. Hoffman waited, as administration after administration ignored the potential, until Barack Obama was elected. The retired senior Department of Energy executive views the growth of US renewables during 2014 as a vindication of what he and his colleagues saw decades ago. Solar & wind = 53% of new US electricity capacity in 2014. CleanTechnica estimates that 54.9% of the installations made in December came from these two sectors and 53.3% of the installations for the year as a whole. 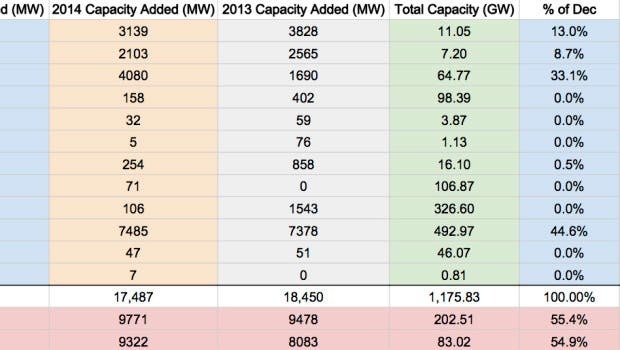 “If the CleanTechnica chart is accurate, more than half of the new capacity added last year is from renewables. This is very significant. I pinch myself when I see these numbers and I am very grateful to see the transition move to the extent it has,” said Hoffman. Though natural gas was still the leading single energy source, in terms of installations during 2014, its 7.5 GW of added capacity is overshadowed by close to 10 GW from the renewable sector. He used the automotive sector to illustrate what is happening with fossil fuels. The trend is to electrification. Around 70% of car trips, in the US, are less than 40 miles. EVs can supply this, but there is still a need for a gas or diesel back-up on longer trips, great charging facilities, a second car in the household for those trips, or a rental or borrowed car. Alternatives, like biofuels and biojet diesel, will eventually replace fossil fuels in sectors like aviation. The US Airforce is already moving in that direction. Even the US Navy, which uses bunker fuel to power many of its ships, is switching over. “I consider offshore wind to be the most important and exciting emerging renewable technology. When you go offshore, the winds are stronger and more steady. That’s really critical because more steady winds produce a higher capacity factor. A larger fraction of the potential is realized in generating energy, which is really the ultimate test. The other thing is that with higher speeds, the economics become much better. The energy extracted from the wind goes as the third power of the wind speed. So if you double the wind speed, you get eight times the power out of that machine,” said Hoffman. Developers can also build larger turbines than on land. There are a lot of logistics involved, but 6 to 7 MW turbines are presently common offshore. Hoffman has seen plans for 10 MW to 15 MW and even a 20 MW turbine. Though the US has been slow to adopt offshore wind, Hofffman expects that to change in the next few years. It will start on the East Coast, where the winds are strong and where a large part of the population lives. This battle is already over in Germany, where the four major utilities have now switched over to become providers of solar energy. They lease solar systems, maintain them, and are now offering energy storage for homes. Hoffman perceives the utility model of a centralized grid as a relic from the past. There will be more of a variety of systems in the future. Some people will utilize battery storage to be independent of the grid, there will be more local microgrids, regional grids, and possibly even a global multinational grid. “I have no question that this is happening. It’s happening as we speak. It will unfold over the next decades, but I think it is inevitable,” said Hoffman. “Eventually Congress will have to move in this direction, even Republicans can get the message,” he said. “What’s going to happen is that people are going to be talking to their members of Congress. The business community has a major impact on Congress and they are going to see it is in their interest to move ahead with a clean energy system.” The US needs to adopt an energy plan, so that people have certainty about the future. Businesses need it, so they can formulate their own strategies. Despite the resistance in Congress, Hoffman believes a carbon tax is inevitable. “Putting a price on emissions” is probably the best way to reduce them. The revenues can be used to reduce other taxes, like income tax, or redistributed to low-income persons who are adversely affected by increased energy costs due to a carbon tax. “I think there are a lot of tradeoffs on a carbon tax that would not only address carbon emissions, but that could also provide revenues that can be applied to other aspects of our economy,” said Hoffman. “I see the early stages of what I consider an inevitable transition away from traditional energy sources, largely fossil fuel sources but also including nuclear to some extent, to an increasing reliance on renewable energy in the form of wind, solar, geothermal, biomass and eventually ocean energy as well.